I decided it was time to start quilting the half a dozen or so tops I've finished. I thought I would start small given the fact that I have done only a little hand sewing since my back surgery. You might remember me showing you this little topper last year. I put it on the longarm not long after Gracie May joined our family. Well, Gracie decided it was the perfect spot to sleep and wound up popping it off the longarm after I had begun stitching it! I decided to put it away and have only quilted one other top since. This is a pattern called Red White and Blue by My Red Door Designs. I loved the fabric on the pattern cover so much and was very lucky to find some still available! There are tiny little stars in each colorway. 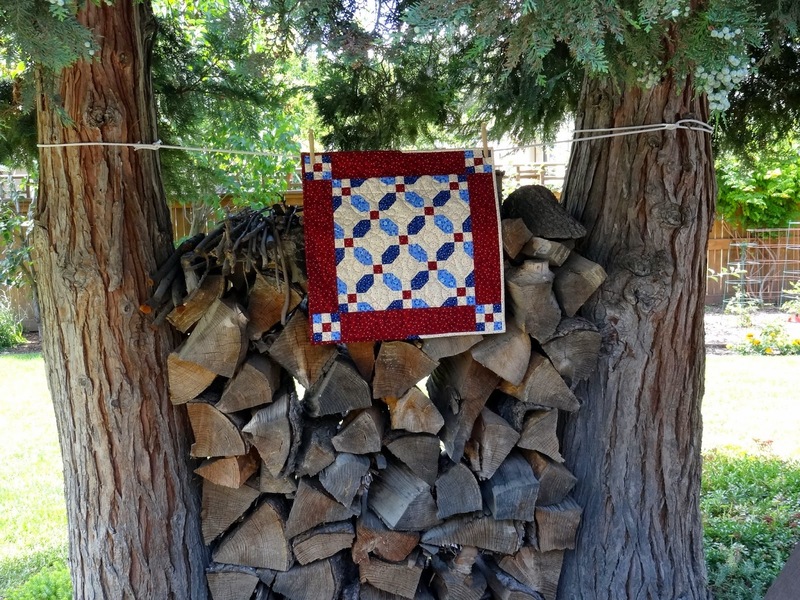 I first hung the quilt between our junipers next to the patio and realized it was dwarfed by the trees and the woodpile! We'll save this location for larger quilts from now on. I quilted it with a simple stars and loops pantograph. The back is leftover dark blue and red scraps and the binding is scrappy. Just in time to add to my 4th of July quilts! I mentioned thread play - not the kind you might think of, though! This one is courtesy of Gracie May! Gee - maybe I can put her to work quilting for me with all the energy she has - NOT! I have to keep the longarm wrapped and pinned tightly or she will chew on cords and play with all the bells and whistles when it isn't in use. Imagine my surprise when I took the cover off the other day and found this! She had to have squirmed her way in and spent some time doing this. I now know to take all thread off the machine when it's not in use. Are you wondering what I quilted with pink thread? It isn't ready for prime time yet, but let's just say it's a beauty and I'll be able to show you early next year. What a sweet little RW&B quilt. It is perfect for the season. That pink thread is a disaster! How the heck did she get in to do that???? Early next year? Can we wait that long??? 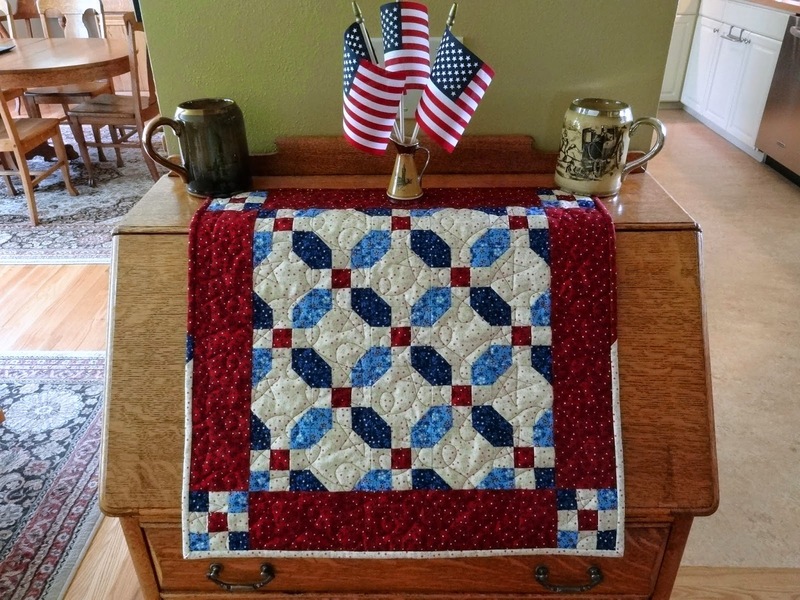 Love your little red white and blue quilt! A word of caution regarding thread and dogs/cats. When Ozzie was younger, he would get into my thread spools anytime he could. One day I had him in the car and was on the way to the grocery store, when I noticed he was pawing at his mouth. I looked inside and his tongue was completely wrapped with black thread! I took him straight to the vet, where the thread was cut off. The doc told me that if animals swallow thread it can get wrapped around their internal organs and kill them! He put a scare into me, I tell you. No more thread around my crazy dog. Love your Red White & Blue quilt Very Sweet ! A very pretty little quilt. I know it must feel good to finish something. That Gracie May is quite the curious kitty. Perhaps pink is her favorite color? All cats must be cast from the same mould because Frankie does the same. All my thread has to be put away after each use because he comes snooping looking for a spool or two that he can shred to pieces. Now what can be pink that we'll see in January? Something for Valentine's Day perhaps? Your patriotic table topper is wonderful. Love the colors and the pattern. It's good to see you back in the saddle so soon after your surgery. 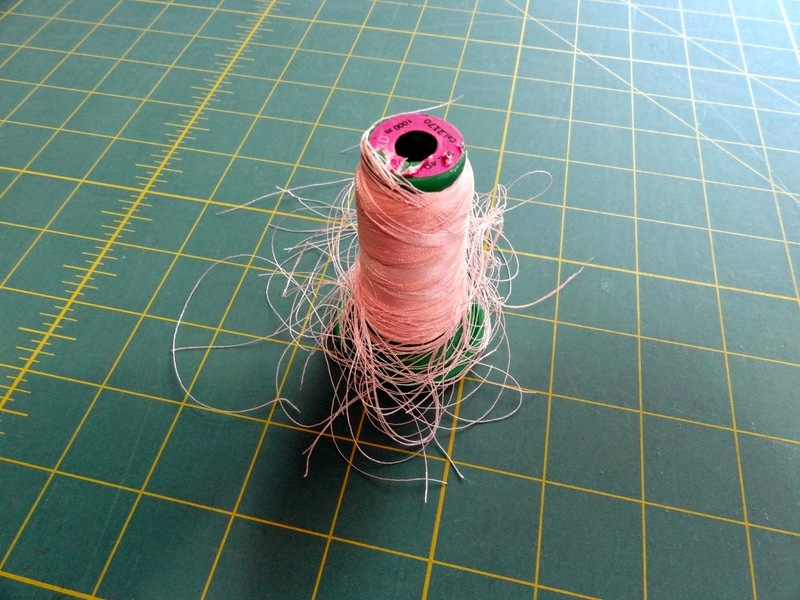 What a thread mess! After reading the comments, I was surprised to hear about cats and what thread can do to them!! I loved where you took the photo of your cute little quilt. I had to show Dave your woodpile. It's actually very pretty! What a busy kitty! I made that rwb quilt last year. I wonder where I put it? Time to get it out for the season. Is there a granddaughter in your future? Gracie is being a stinker!! They can be a trial for sure, but let's HOPE that she'll calm down some as she gets older. Your quilt is adorable. Love how you quilted it! Love your little red, white and blue quilt. Perfect time of year to finish it and have it on display. That Gracie May, she's a scamp - if only she knew how expensive thread was. Hugs!! Your RWB quilt is great. As for the pink thread, what can I say? I suggest you deduct the cost from Gracie May's "pocket money". I'm sure the quilt shop would take payment in cat treats! very sweet little quilt! Yes, a kitten can be a bit of a trial! I also have a 8 month old, and the water spray bottle can get a workout, in the air usually works, but sometimes a foof at her mooch is needed! Oh, bad kitty. Looks like something a puppy would do. Can't wait to see the future quilt done in pink. Cats -- gotta love them! Your quilt is lovely! I had some of my sewing supplies on the floor in the guest room, including a big glass container of thread. Last year, our new little Scottie discovered them and must have gone through six spools of thread! Of course, that can be dangerous as a friend of mine had to take her dog to the vet when it got thread wound around it's tongue. Pets! I had some of my sewing supplies on the floor in the guest room, including a big glass container of thread. Last year, our new little Scottie discovered them and must have gone through six spools of thread! Of course, that can be dangerous as Nicole says. A very impressive wood pile, and so is the red, white & blue quilt. You did a great job. So happy to see you are back to quilting again. Gracie May is a determined little thing. Can't wait to see why you were working with the pink thread. Hmmmm, curious. Good luck with your recovery Candace. The quilt is so pretty. I really like red white and blue together in geometric designs. I had a similar thing happen with a ball of wool which one hound thought could be a play ball. It took me a whole evening to untangle and rewind it! Pesky pets! A friend of mine lost a loved kitty due to same thread issues....be very careful my friend. Your quilts are darling. I remember this quilt from when you made the top. Beautiful finish!